Playground equipment is nice and all, but not everyone has the luxury of a spacious backyard and extra income to put towards the initial investment and maintenance. If you want your child to have all the fun, flight-like fun they experience at the park, why not try the DIY version? Tree swings are a great way to add a little flare to the yard without spending too much time or money on the project. All you need is a good, sturdy tree with the right branches. Scope out the area to make sure your swing won’t collide with anything nearby, find a branch that is at least eight inches in diameter and free of disease and rot, and then get yourself the proper rope. Can hold up to 2,800 lbs. The carabiner can hold up to 1,200 lbs. Weatherproofed, meaning it can hold up in all seasons under any weather conditions. Has very little stretch, meaning it won’t degrade or lose shape. Easy installation that takes under 15 minutes to install completely. In our continued effort to provide the most current and highly-rated items available, our research team has recently removed some of the older products from this guide. We’ve replaced them with more current items, found preferable by a wide base of users. Although two of the Top 3 picks have remained the same, there is a new product in the number one spot--SGT Knots nylon rope. In addition to a new top pick, three new products have been added to the list. All product information has been checked and verified as accurate. 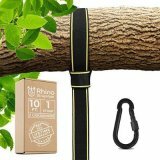 EASY HANG (4FT) TREE SWING STRAP Holds 2200lbs. Only comes in 10 feet spools. 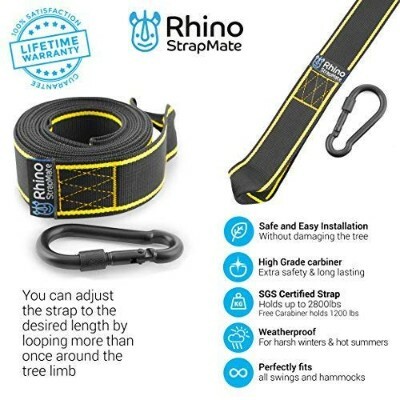 The Rhino StrapMate Tree Swing Hanging Kit is easy to install and very strong, capable of holding up to 2,800 pounds of dead weight as certified by the SGS. 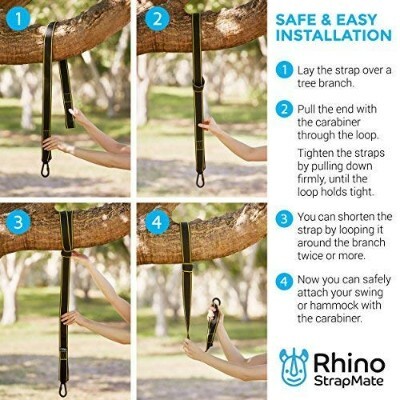 These are the qualities that make the Rhino StrapMate such a favorite among DIY tree swing makers. More than that, however, is the fact that the Rhino is fully weatherproofed, capable of standing up to hot summers and even the harshest of winters without degrading. Whether you’re looking to hang a tire swing or hammock, this kit can help you get the job done. Each strap is 10-foot long and can easily be adjusted as your child grows. Installation is easy so you can have your child enjoying their swing in minutes. Lay one strap over the post, beam, or branch and pull the carabiner end through the other end. 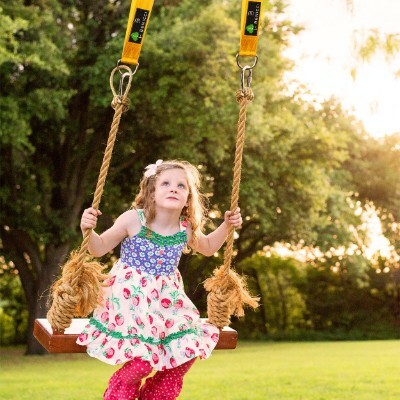 Finally, hook the carabiner to the swing and your child is ready to swing. They’re just as easy to disassemble. This simply means the height at which you mounted the swing will remain the same throughout the duration of its lifespan. 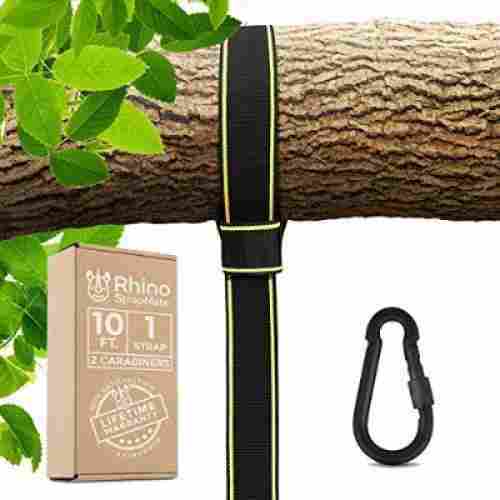 The construction of the 2.5-inch wide straps also provide for safety for the tree while also allowing for no stretch. It also features a carabiner that has been certified to hold up to 1,200 pounds of weight. SGT Knots is one of the top contenders when it comes to suggested rope for tree swings. 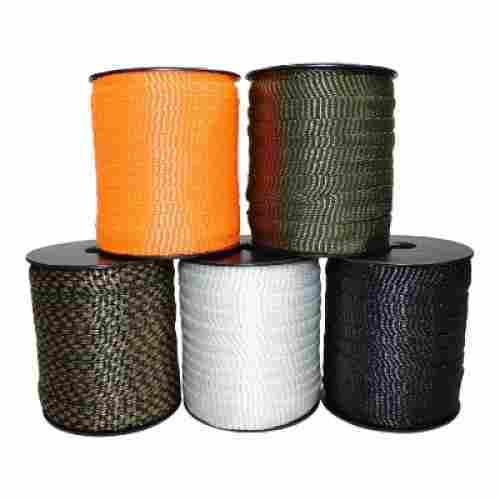 This polyester webbing combines the strength of heavy-duty rope with the even distribution of flat webbing. The fibers are tightly woven together to make them capable of high-tension weight bearing. They’re resistant to sunlight, chemicals, abrasions, oils, and moisture. Rain or shine, this polyester webbing will perform. It’s flat, making it easier to lie snugly against the branch, and it can hold a pretty substantial amount of weight, so kids can swing freely and you can rest easy knowing they’re secure. Kids absorb important vitamins by spending time in the sun, and there are tons of studies linking outdoor exposure to more positive moods and less stress. Swings are a fun way to work little leg muscles, and give kids some confidence, as well! You can choose between lengths of 100 feet, 300 feet, 500 feet, or 3000 feet, all pre-cut for your convenience. It’s ⅝ of an inch think, and available in black, camouflage, olive green, and white. The company itself is owned and operated by veterans, and all products are made in the USA. SGT Knots is dedicated to its customers and intends to bring only the utmost satisfaction with each and every purchase. These ropes can hold up to 1800 pounds, and the low-stretch fabric won’t loosen, distory, or tear under the brunt of heavy loads. 3. 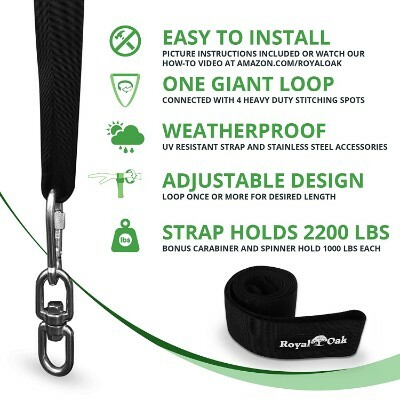 EASY HANG (4FT) TREE SWING STRAP Holds 2200lbs. This swing strap is resistant to a lot of things, making it reliable and strong for the intended swing. It is resilient to hot and cold weather, friction, UV rays, and chemicals, plus it is waterproof. The carabiner hook is constructed of industrial steel and is almost indestructible. Instructions with pictures is included for this strap that is easy to hang in just minutes. 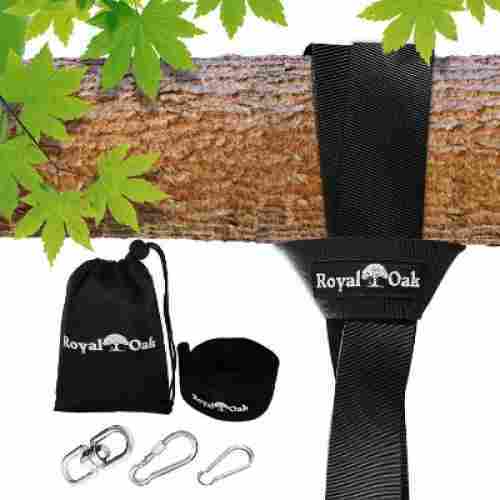 For a swing attachment that will not harm the tree, get this swing strap for your swinging enjoyment. It can hold up to 2200 pounds and is ideal for all types of swings. Choose this great natural, biodegradable rope for your tree swing, so your kids can enjoy the long, hot days of summer in a fantastic way. Various lengths and thicknesses are offered, so you can purchase the best size for your tree swing project. This one is durable but pliable enough to work with smoothly. It is untreated, so no chemicals, oils, or artificial agents were used during the manufacturing. Manila hemp fibers are the usual choice of material for natural-fiber ropes, but this one is made of natural Agave fibers. 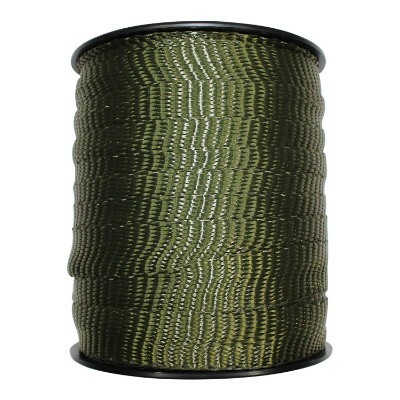 It has more stretch and ability to twist, which makes tying knots much easier than other fibers. 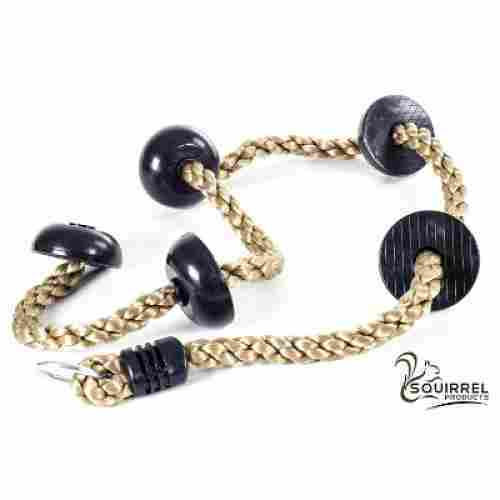 Take your backyard play area to the next level with the Squirrel climbing rope . Not only do the platforms make it easier for your child to climb the rope but they also provide a stable resting place for your child’s feet if they get tired. As your child works their way up the climbing rope they will be strengthening the muscles in their arms, legs, and core. Furthermore, they will be relieving stress as they exercise. 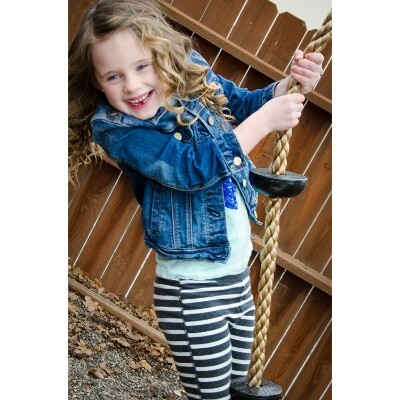 Children of all ages can enjoy scaling this rope as its maximum weight limit is 150 pounds. Their fine motor skills will increase as they work to grasp the rope. The material of the rope is soft, thus giving your child a comfortable grip as they climb. 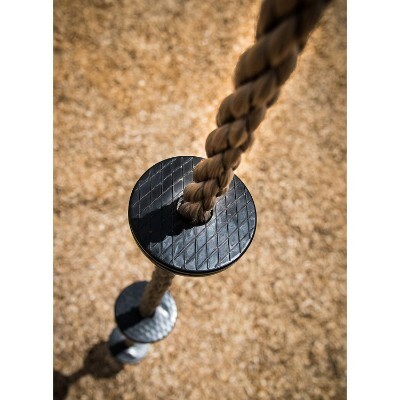 With your purchase, you will also receive a metal ring that makes it easy for you to connect the rope to any playset. The five platforms make climbing the rope easier for children as well as providing them with stability. You won’t have to worry about them getting rope burn, as the material provides their hands with a soft comfortable grip. Boasts an insane weight limit of 420 lbs. Resistant to mildew, rot, oil, and chemical agents such as pesticides. Features low stretch, meaning the rope keeps its shape and durability after every use. Made of polypropylene, which makes it a great general use rope. Will last for years without rotting or snapping. Cannot withstand intense weather conditions like extremely heavy rainfall. Most serious tree swing builders don’t actually recommend polypropylene ropes, but it does have unique qualities of its own that make it a general purpose rope. Consider for instance the Koch Twisted Polypropylene Rope. This has been especially designed to be highly resistant to oils, mildew, and most chemicals. It has also been treated to help guarantee that it won’t degrade or rot easily, something that is characteristic of materials of this type. This means that, given you don’t unnecessarily expose it to severe weather conditions, it should stay just fine. More importantly, however, is the fact that the Koch has very low stretch. We find the construction and material of the rope, polypropylene, to be extremely beneficial for general usage. While this rope can be used for swings, it can also be used for other outdoor activities such as camping. This is an exceptional quality in a rope for tree swings as you don’t want the swing to go lower towards the ground every time someone sits and rides on it. 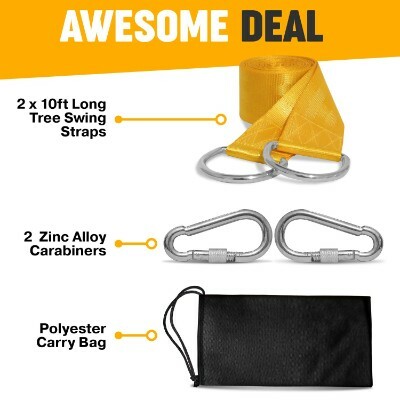 The Benicci tree swing hanging kit makes hanging your swing or hammock easy and stress-free.The included carrying pouch makes it easy for you to transport your straps and carabiners so you can build a swing anywhere. The long straps make it easy for you to adjust the swing to the desired height. Since the straps are durable and can be adjusted you can continue to use them as your child grows. The carabiners are rust resistant and will remain in good condition for years to come. The straps are also highly durable as they are composed of polyester. With your purchase, you will also receive a carrying pouch that makes it easy to store and transport the straps. Included in the set are two 10-foot long swing straps and two carabiners. Together they allow the swing to support up to 2000 pounds. However, it is the stiffness that makes it less stretchy than the others and the perfect support for a tree swing. The selection of colors offered is fantastic, so pick one that is your favorite. Two lengths are available in this lightweight, strong cord. If you are looking for something a bit different than the traditional natural-fiber ropes for your tree swing, then this is a great choice that you will please you. This cord is thinner than the natural fiber ropes that we feature, but it is just as strong. 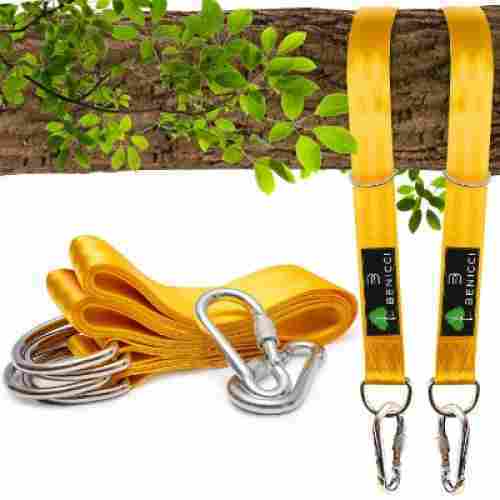 It is durable and can support heavy weights for almost any type of tree swing you want. 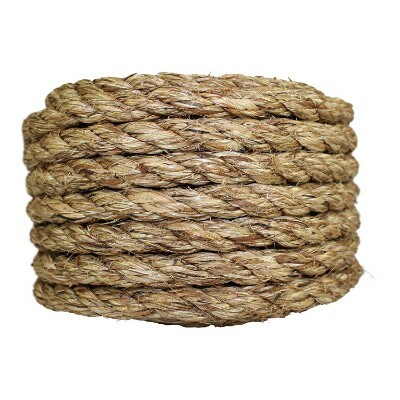 Made of three twisted fibers of manila hemp, this rope is one of the best choices for tree swings. It can support heavy weights for any type of swing you choose, plus it is durable and long-lasting. This item is specially treated with oil to increase the resilience to weather and moisture. Natural fiber ropes make some of the best swings because they not only look great, but they seem to outlast some of the other synthetic products on the market. The durability of this rope is fantastic! It will stay strong in very cold and hot weather and all types of moisture. It is a dependable choice for your tree swing needs. Polypropylene rope is some of the most highly recommended when it comes to mounting swings in your yard. This SGT Knots Pro Manila is a lightweight synthetic version of classic manila fiber. H SGT Knots is a veteran owned and operated company made up of former Marine Corps members. They believe in carrying on the Semper Fidelis motto in every capacity of their life and business, so you can count on them to serve you to the best of their abilities. 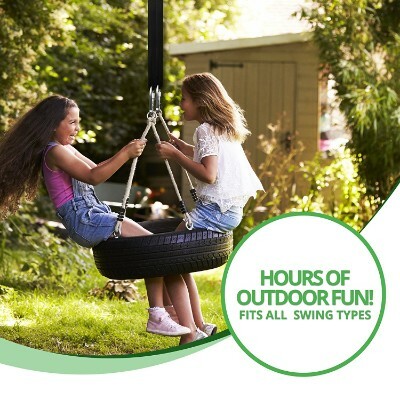 Tree swings are a cost-effective way to get a little slice of classic playground fun right in your own yard. Long before the days of elaborate play structures, families were tying tires and saucers to trees and kids were hollering and swinging on them. The three-strand rope also has premium shock absorption and won’t kink. You can choose between 10 feet, 25 feet, 50 feet, 100 feet, and 600 feet of pre cut rope, in ¼ inch, 5/16 inch, ⅜ inch, ½ inch, ⅝ inch, ¾ inch, 1 inch, 1 ¼ inch, 1 ½ inch, and 2 inch diameter. Highly resistant to temperature and weather, this coil can hold up under UV rays, chemicals, and oils It’s a more affordable alternative than natural manila, and with a better performance record besides. Plenty of ropes come in varied pre-cut lengths, but it’s not often you get to specify or customize the diameter. With so many options available, you truly can order just the right size for your needs. Installing a tree swing can be a very easy endeavor. However, there are certain things that you have to consider especially when choosing the rope that essentially forms the bridge between the tree branch and the platform upon which your kid will be sitting on. Here are some of the things that you may need to look for when choosing the best rope for your tree swing. A rope can have a number of resistances, but there are a few that we believed took precedence over others. For instance, water resistance, specifically salt-water resistance, were high on our list. This is because of the amount of rain a rope swing will see in its lifetime. We also took weather resistance into great consideration because temperatures have a direct effect on the overall integrity of rope. UV resistance was also very high on our list because of the amount of sunlight the average tree swing will undergo in its lifetime. It is important to take note that there are a variety of roping materials for swings. This often has implications in their durability or the length of time it will need before the materials used in its construction start to wear away. Know, too, that the more durable the material is the more expensive it usually is. Though the ropes on our list do not have all of these resistances and treatments, they have at least one. This allows the buyer to buy a rope that they feel best matches their setting and circumstances. If you don’t live a particularly sunny area, or your tree swing is shaded most of the day, then a UV resistant rope will not be very beneficial for you or your family. Swinging helps with sensory integration – Swinging helps the brain process a variety of information all at the same time. 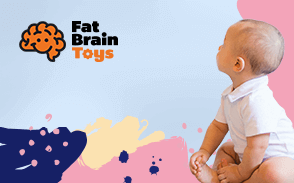 Visual, kinesthetic, auditory, olfactory, body awareness, and movement inputs together with the pull of gravity are all integrated into the brain allowing for faster integration and processing, leading to better learning and the molding of behavior in the future. Swinging aids in the enhancement of balance – Children have to work against gravity to maintain a more stable balance of the body. Rocking their bodies to and fro leads to the strengthening of the core muscles which helps in the more efficient development of balance. Swinging may provide for calm and relaxation – Experts believe that this has something to do with our instincts. The gentle rocking motion of the swing brings us back in time when we were calmly soothed by the fluids in our mother’s womb. Exactly how it works still remains to be adequately explained, however. Swinging is definitely not only for kids. It’s great for adults, too. 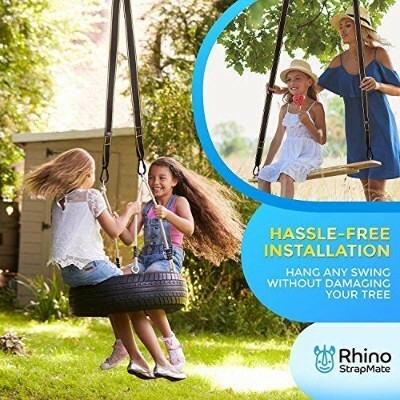 Choosing the right rope for your tree swing means choosing one that is durable, strong, has exceptional UV resistance, has no or minimal stretch, and easy to install, too. With the 5 best ropes for tree swings, you can easily make one for you and your kids right in your backyard. Akin to a rope’s durability is its strength. However, it is crucial to understand that there strength pertains more to the ability of the rope to hold as much weight as possible without breaking or losing its integrity. Obviously, metal chains provide you with the greatest strength while polyesters are also exceptional when it comes to synthetics. 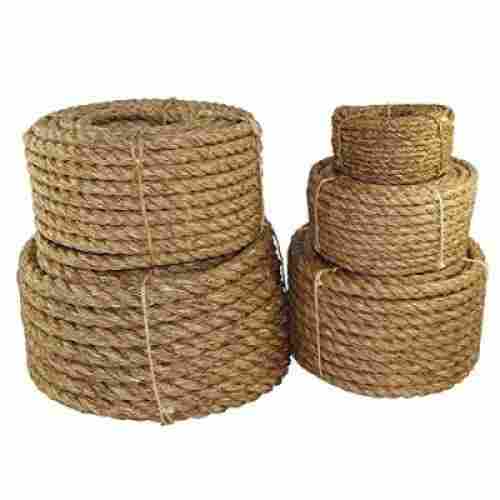 If you’re choosing natural fibers, Manila rope seems to be an excellent choice, although it is quite pricey. Nylon is super strong but, again has the tendency to be quite slippery and as such is not really ideal for swings that are primarily intended for young kids. Polypropylene ropes can be strong, too, provided you don’t unnecessarily expose them to the elements. Perhaps your choice of rope is best defined by who will be riding on the swing. If it is primarily children and that ample signage be posted to prevent adults from using the swing, then any of these choices should be great. But, if you’re making a swing that’s intended to hold even adults, then it’s crucial to choose a really strong rope. Additionally, while metal chains are strong, these are not really ideal for tree swings and should only be mounted on eye bolts. You don’t want your kid to be swinging lower and lower every time he or she takes a seat. That’s why it’s important to choose one that has little or no stretch. Nylon has the tendency to stretch while polyester gives you very little stretch. Of course, you have metal chains having no stretch at all. Polypropylene, simply, is a plastic made from combining propylene monomers. Essentially polypropylene combines the best features of propylene into a single plastic. Polypropylene is known for its chemical resistance, toughness, elasticity, insulation, and resistance to wear and tear. Features like this make polypropylene perfect for tree swing and other outdoor endeavors. q: How should I judge a rope’s tensile strength? To judge a rope’s tensile strength accurately, you must first understand that tensile strength is used to refer to new rope. This tensile strength is determined under factor conditions and therefore can never accurately represent real world circumstances. Tensile strength also is cut half each time you make a knot. The general guide is that when 8 knots are made in rope the tensile strength is reduced by about 50% depending on the rope. But, above all, tensile strength is used to determine how much weight a rope can handle over a period of time. As long as you understand those basic things, you can accurately judge a rope’s tensile strength for your needs. q: Why should I be concerned with weight distribution on a tree branch? An even amount of weight distribution means that no point of the tree branch is carrying more weight than another point. This is particular important for child safety. If one point of the branch has too much weight, that point weakens over time. Given enough time, that point on the branch will become a point of breakage. When you evenly distribute the weight over a larger surface area, you minimize the chances of breakage. q: What does ‘low stretch’ mean? The term ‘low stretch’ refers to the amount of stretching a rope does trough when weight is applied. If a rope has ‘low stretch,’ that means the rope stretches very little when weight is applied. Conversely, a rope is considered to have ‘high stretch’ if it stretches out a lot when weight is applied. For tree swing projects, you want a rope to have very little stretch whenever possible. Not necessarily. While you want to have as little stretch as possible, completely no stretch rope is virtually impossible to come across. Even great ropes stretch a little bit, even though this amount of stretch isn’t noticeable to the human eye. So, don’t be concerned if your rope stretches a tiny amount. As with anything carrying a substantial amount of weight, some type of strain will occur. q: How trustworthy are these weight limits? We trust the manufacturers when they claim the weight limit of their rope. However, just because the weight limit of a rope is over 1,000 lbs. does not mean the tree can hold that much weight. Most trees sturdy enough to house a respectable tree swing can hold quite a bit of weight, but always check the strength of the branch before building a swing. To effectively check the strength of a tree branch, tie a heavy weight to the end of a rope and attach this weighted rope to the tree. If the branch bows or dips a considerable amount then it’s not strong enough to hold your child. q: What size of rope is best for a tree swing? The size of rope depends on the kind of rope you purchase and the kind of tree you eventually build the swing in. If the tree is larger and older, say an old oak tree, you want a coarser, thicker rope because the rough bark of the tree can handle the coarser material. If you build the swing into a cypress, however, you want a gentler rope as to not disturbed the bark of the cypress tree. q: When is it time to retire a tree swing? The best time to retire a tree swing is when you notice signs of degradation. This can be a number of things like: high stretch, fraying of rope, weakening of rope, rope discoloration, loss of shape, creaking or snapping sounds, etc. If you notice any of these signs or a combination of these signs, then it’s likely that you need to retire the tree swing. After you remove the tree swing, check out the branch to see if the tree is strong enough to house another one. If the branch looks weak or brittle, relocate the new swing.